A surface look at Lejonklou’s top amps would likely file them under ‘quirky’. A fully dual-mono preamplifier and power amplifier, with a relatively low power output, the kind of minimalism that borders on outright nihilism, and a decidedly ‘Scandiwegian’ nomenclature puts this relatively unknown four-boxer in the ‘huh?’ camp. Then you listen to them. 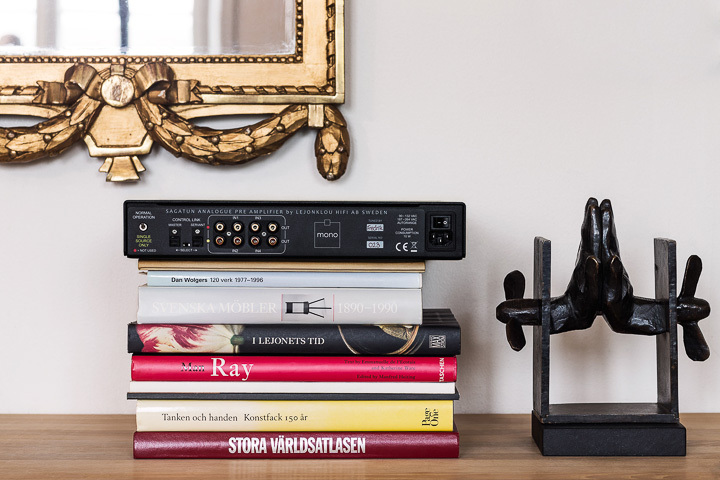 Lejonklou – the brand – is the brain-child of Uppsala-based Fredrik Lejonklou, an electronics engineer and music lover who is perhaps best-known for his excellent moving magnet phono stages. Lejonklou (the man and the brand) has been strongly influenced by Linn and Naim (reputedly from his teenage years) and in particular the classic ‘Tune Dem’ used by Linn Products to evaluate and demonstrate its audio products. However, the Sagatun Mono and Tundra Mono arguably take the Tune Dem farther than Linn does today. The amplifiers all use a dual Switch Mode Power Supplies (SMPS), arranged not as one-per-channel – which is common – but always as one for positive rail and one for negative rail. This arrangement is twice as expensive as normal SMPS designs, but with no increase in power. When one power supply (in the power amps, where power is needed) pushes the loudspeaker drive units out, the second power supply is resting. And when the second power supply is pulling the drive units in, the first power supply is resting. The reason for this design is not more power, but more control of that power. In each SMPS, there is a feedback loop that makes sure the output voltage is stable. When using a single power supply, with positive and negative voltages (the standard arrangement), only one feedback loop is possible, despite this loop affecting both voltages. When the amp needs to deliver a positive current to push the speaker drive units out, the feedback loop will adjust the switching signal inside the SMPS in order to keep the voltage at the output perfectly stable. This works well for the positive rail BUT at the same time, the negative rail will also be adjusted! So instead of staying stable, the negative rail will fluctuate each time the positive rail delivers current. And vice versa. The only way to stop the postive and negative rails from affecting each other in this way is to use TWO power supplies, each with their own feedback loops. The 40W Tundra Mono uses the latest – and supposedly the best – Thermal Interface Material (TIM) that quickly moves any heat generated by the output devices on to 1.2kg of copper heatsink (from whence it dissipates to the aluminium case and to the air). There is also a spring loaded transistor clamp which keeps the pressure against the TIM and copper constant at all temperatures, and a trimmable main idling current, which is useful in settings where heat could remain a problem (such as inside a cabinet). The amount of cooling affects the idling current and therefore the performance of all amplifiers, but this trim function reduces the potential problem to a minimum. It’s like designing the amplifier for its surroundings. This requires plugging the supplied multimeter into the Status Port, turning the trim dial, and repeating the process a few hours later when everything has stabilised. This is explained in the supplied manual, which is useful if a little terse. Or minimalist, as befits the amplifier.